Iran Air meals are included in the price of your ticket. The airline operates their inflight catering kitchens that cater all flights ex Iran. All meals served on Iran Air are Halal certified and note the airline does not serve alcohol. Flight time will dictate what is served, on longer routes expect a choice of hot meals and a range of starters/entrees. An example photo of a standard economy class meal is shown below. 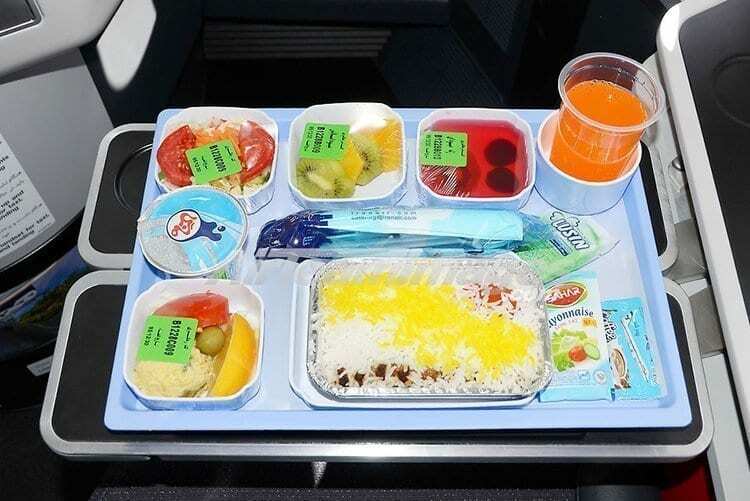 The following special meals can be ordered on Iran Air flights, Diabetic Meal, Gluten Free Meal, Low Fat Meal, Low Salt Meal, Bland Meal, Low Purine, Low Calorie, No Lactose Meal, Vegetarian meal (Lacto-Ovo), Vegetarian Meal, Asian Vegetarian Meal, Hindu Meal, Muslim Meal, Baby Meal, Child Meal, Fruit Platter and Special Meal. For the entire Special Meals list, please see below. To contact the airline to book your special meal view all their contacts here.